Shaiha's Ramblings: A Look Back. One thing I have found as I get older is that time tends to run together. I will start thinking about things in the past and realize that the event happened years in the past. I couldn't really tell what I was up to say last February and then it occurred to me that I could just look back in my blog. Want to look back with me? Let's see...last February I posted 13 times. I guess that I do tend to slow down in the winter though I was still going strong in the Year of Jewelry Project. And it looks like that is when I started to play with patinas. I haven't gone much further with them because I tend to be impatient. When I sit down to play, I want everything to be ready to use. I will get an idea that requires using patina, sit down and do it real quick and by the time it dries, I have forgotten the idea. 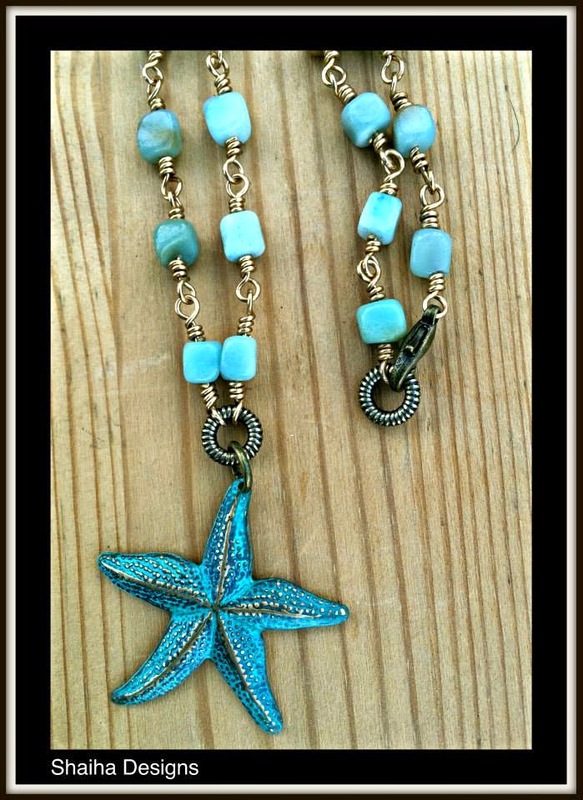 That beautiful starfish above is from Patina Queen. Yep. It was ready to use. I looks like I was listening to an audio book by Lisa Gardner, Touch and Go. This rather amused me as I said in my review that I wanted to listen to more book featuring the main character. I just started listening to Love You More which is Tessa's story. Not quite sure why it has taken me a year though. Looks like I finished the month off with patina as part of a blog hop. 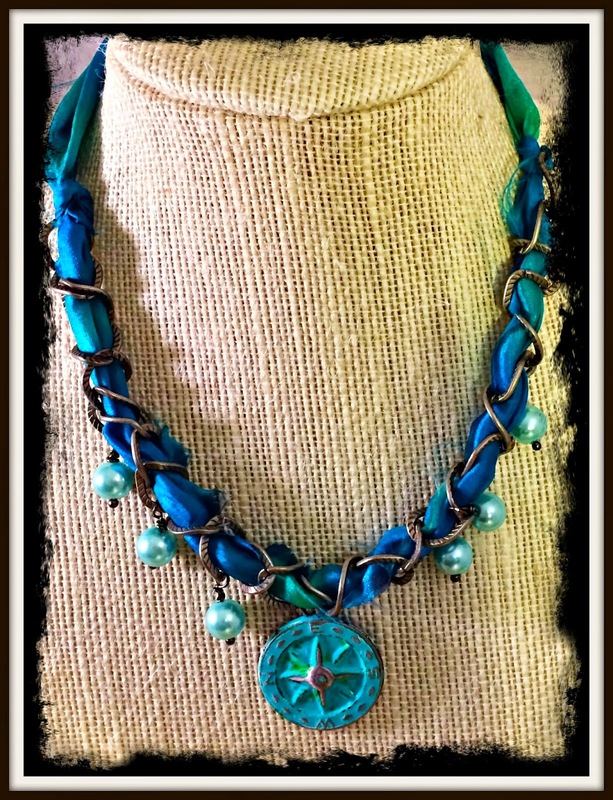 I was lucky enough to win that gorgeous medallion and I got to play with patina. Yes you heard that right. I actually sat down and played with the inks. I really enjoyed it too and I do try to plan days to do nothing but that but I get down to my studio and those beads call my name. It doesn't look like I have started with my weekly ramblings yet which will make it easier to see what else was going on during a month. It just occurred to me that my ramblings is actually taking this blog back to its roots as I started it as a journal for myself. Now it is so many things. 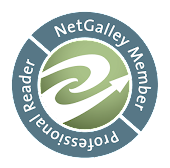 A place to share reviews on books I have had the opportunity to read, showing off my jewelry and just a way to connect to others. But it should still be a journal. These are both beautiful necklaces. It's fun to look back. I am like you - impatient. It keeps me from trying more things. I want to work on that this year. I like your ramblings. It's cool to peek into someone's life and see what it's like that week. And it's a nice reminder for you! Hi Shai, I enjoy sharing other peoples lives via their blogs and yours is one I read regularly. Thanx for sharing. Both of your necklaces in this post are wonderful. The color you used in them is my favorite.